I can’t believe September is over already, it went so fast. However, October promises to be a big month. First, I am really excited to be up here in New Hampshire during the fall foliage season. The colors are already stunning and the peak is just around the corner. This also means a lot of visitors to the area which makes things vibrant. It is also county fair season up here and the farmers’ market are brimming with fresh produce. Add to this a series of good old fashioned country estate auctions coming up next week, and I will have plenty to do an report about here. So stay tuned. At the end of the month, I am off for my annual fall vacation. After visiting Buenos Aires, Argentina two years in a row, I am off to Italy – Umbria via Roma – for a week and another week in London to get me Anglophile fix to get me through the winter. Of course, complete reports on my travels and “finds” will be posted right here. Wherever you are, and whatever you do this weekend, I hope you have a good one and “find” at least one thing that makes your day a little brighter. I recently raved about the Peabody Essex Museum (PEM) in Salem, MA and their current Painting the American Vision exhibition. I was lucky to visit the museum last Saturday with my life-long friend Claire and thoroughly enjoyed the Painting the American Vision exhibition. 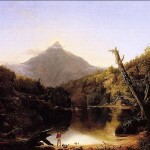 I was particularly thrilled to see the works of artist Thomas Cole (1801-1848) on display. 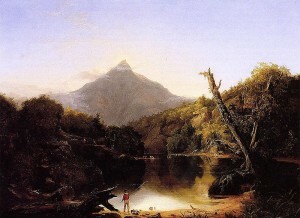 I was immediately drawn to his “Mount Chocorua New Hampshire 1827” work, which I had only seen pictures of in the past. Seeing this work live was a great experience. Although the painting is much humbler in scale compared to Cole’s epic works, I was touched by the locale. I often tell people that Mount Chocorua is in my back yard. Although not literally in my back yard, Mount Chocorua is just a couple of miles from the NH family estate where I am spending my sabbatical. Seeing Cole’s work from over 180 years ago painted so close to where I live was just amazing. Even more amazing is how little the landscape has changes in the intervening years. Mount Chocorua is still stunning, as I noted in a recent post. The Painting the American Vision exhibition continues through November 6, 2011 at PEM. Were you to tell me at any point in my adult life that I would ever read a book by singer-poet Patti Smith and thoroughly enjoy it I would have told you were crazy. 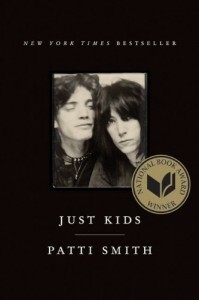 However, upon the recommendations of a diverse group of people whom I respect, I read Ms. Smith’s memoir, Just Kids, and well, I loved it. All I really knew of Ms. Smith (the iconic “godmother” of punk) was some of her music (notably her one big pop hit “Because the Night”) and vague references to her throughout the years. To me, Smith was a subculture figure embraced by people like my older brother, who I remember liked her in the late 70’s while I was spinning my Olivia Newton-John 45s all day in my room. I approached Just Kids with an open mind and found myself thoroughly engrossed in Ms. Smith’s story of her early days in New York and her relationship with controversial artist Robert Mapplethorpe. Ms. Smith tells her and Mapplethorpe’s story (ultimately a tragic love story) with honesty and limited sentimentality and she does a remarkable job. I came away with a greater appreciation of these two artists as well as a better understanding of New York in the late 60’s and 70’s and the artistic spirit of the era. I generally like memoirs, so I can’t say this book’s appeal would be universal. However, I think the skill of Ms. Smith as an author telling her story with poetic honesty would be compelling for just about anyone interested in a well-told life story. I’d say this is a classic case of don’t judge a book by it’s cover. Just Kids is available from Amazon and other booksellers. I won’t lie. Part of my nesting for the inevitable harsh New Hampshire winter includes stockpiling bourbon. This was not really my plan, but since I have been talking about my love for bourbon people have been giving me bottles of the stuff as gifts. I have quite a collection now – about seven different varieties are on display in my liquor cabinet. Don’t worry, part of the reason I have this stockpile is that I rarely drink it, I wait for special occasions or when entertaining. Anyway, I love bourbon and always thought it would be fun to have a flask in which to carry the stuff around. I have seen many flasks that are quite ornate and pricey. However, I recently came across Smathers & Branson, a company that, believe it or not, specializes in needlepoint accessories. 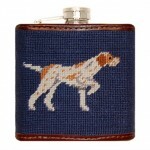 Although Smathers & Branson sells mostly belts and other such things that one expects from needlepoint, they also have a collection of flasks. I can imagine pulling out one of these and taking a swing at my next family dinner. Oh my poor mother. See all of the great needlepoint products Smathers & Branson offers here. It is clear that I could go on for days singing the praises of Wellfleet, MA and all the great things we did there on our end-of-summer vacation. However, like summer itself, we must move on – but first one final wrap-up of some of the great things we found there. First, no trip to Wellfleet would be complete without a pilgrimage to Jules Besch Stationers. In fact, Lynda (and sometimes Sophie) and I have been known to make special trips to this amazing shop off season. Jules Besch Stationers has extraordinary cards, fine stationery, journals, papers, and pens and is just great fun to visit and chat with Michael the proprietor, who always entertains us with hints and teases about the store’s upcoming special events. We also stopped in at Billingsgate Arts and Antiques to find it thriving nearly a year after we first stumbled upon it on its opening weekend. Billingsgate Arts and Antiques describes themselves as “a new center bringing back the fine Cape Cod tradition of Antiques and Art coupled with working Artists and Craftsmen.” We enjoyed our visit and were thrilled to see that they have definitely found their groove. 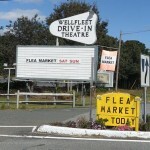 Meanwhile, we made three visits to the Wellfleet Drive in Flea Market while we were there. 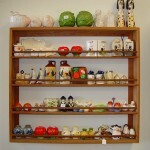 The Flea Market is a hybrid of vintage goods, new goods, arts and crafts and swap meet. We like to say “from tube socks to fine antiques.” We love browsing this market and have made some great finds there over the years. In fact, a bit of Lost Cowboy trivia: The original purchase of the little cowboy figurine that was the inspiration for this blog’s charter was purchased at the Wellfleet Drive in Flea Market in 2009. This year we found some more great stuff. However, it was the people we met this year that made our visits special. On the first day of vacation we stopped in and met a vendor named Homer (middle name Virgil) who was a complete delight. Homer had some lovely items for sale which we discussed with him and he also gave us some tips for what to do while we were in town. Lynda was particularly charmed by Homer and we made sure to stop in on our way out of town to bid farewell. On Homer’s recommendation we sought out the local artist Julia Salinger who owns the Mermaid’s Grange gallery in Wellfleet where she displays her work. Lynda ran into Ms. Salinger a couple of time around town and she was very sweet to us. 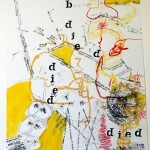 Her work is a mix of collage and sculpture and is as unique as she is. Ms. Salinger’s work can be found on her Mermaid’s Grange website. We did so many fun things on the trip and made some great discoveries. One of the best stops we made was at a church tag sale in Truro on the back road to Provincetown. Lynda posted a great story about this on her blog, Grateful Evermore. The church was holding a “shed sale” where they were selling stuff to raise money. The shed was full or books and bric-a-brac and it was great fun. 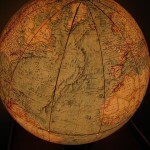 Lynda ended up with the “find” of all finds – a very cool light up globe, which set her back a very sweet $3.00! Awesome. It was a great vacation and I thank you for indulging me in my posts about all the great things Wellfleet has to offer. I can’t wait for next year. 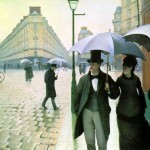 In the meantime, I have a busy fall coming up with travel to Italy and London – so stay tuned. One of my astute readers pointed out that part of my post on Friday featured a bunch of restaurants I visited during my recent vacation, but I had mentioned before that I was looking forward to cooking on the trip. I confess! My traveling companion, Lynda, and I did not cook in as much as we planned despite a well-appointed (if not “gourmet”) kitchen in our vacation rental. In a pre-vacation post I mentioned that I had harvested some basil from my container garden and planned to bring it on vacation to use in some new recipes. Why it may be true that we dined out all around town, I am pleased to note that my basil was used in two of the best meals we had all week. First, Lynda and I made one our favorite summer treats – the goat cheese, tomato, fresh basil, olive oil on baguette concoction we discovered last year on our Wellfleet trip (see that post here). This year we visited the same vendor at the farmers’ market in Provincetown to purchase the goat cheese. We made this meal as a treat for our great friend who took us out on his boat for a private whale watch off the tip of Cape Cod. (Which was awesome by the way!) The meal was great and my basil made it extra special. The perfect cap to a great vacation day. Next, my basil was a key ingredient in the dish Lynda was dying to make while on vacation: a Layered Eggplant, Zucchini and Tomato Casserole which she found in Food & Wine magazine. Lynda went to the local market to purchase all the ingredients and we teamed up to prepare the dish. We followed the recipe pretty much to the letter and the end result was glorious. It was a delicious meal, almost like a lasagna without any noodles. It was wonderful right out of the oven and I might say even better warmed over the next day. Needless-to-say, the Layered Eggplant, Zucchini and Tomato Casserole was the hit of the week and I like to think it was the basil from my container garden that put it over the top. In any case, this is a recipe we will be making again with some variations here and there – like different cheeses of toppings. 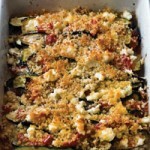 Find the Layered Eggplant, Zucchini and Tomato Casserole recipe from Food & Wine magazine here. Due to a damp weather forecast and the investment in time we need to make to pack up and travel from our base in NH – we will not be selling at Todd Farm tomorrow (Sept. 25) morning as originally planned. We hope to regroup and present an even bigger sale at Todd Farm on a Sunday in the very near future – stay tuned. We apologize for any disappointment this announcement may cause. Fist up – for those of you who have been waiting for our next sale at Todd Farm – we will be setting up this Sunday (Sept. 25) weather permitting. Look for us behind the barn. We will have more of the great buttons and sewing collectibles from my mother’s vast collection, as well as some cool new vintage finds we picked up over the summer. Bookstore Restaurant – nice casual harbor side dining and bar. Pearl – fine dining on the harbor – great mixed crowd. The Lighthouse – old school town restaurant/bar – we had the best chicken salad sandwich ever here. Wellfleet Town Pizza – the best pizza and salads around – worth the inevitable wait on summer weekends. Winslow’s Tavern – in town dining – very nice! Fans of Lost Cowboy know that I (your friendly blog curator Jim) is a huge theater fan. I love all kinds of live theater and have seen hundreds of productions over the years – some great, some interesting and yes, some really bad. However, I like it all and still get a thrill every time the lights go down and the production begins. I particularly like the abundance of theater that pops up in the summer. All over the country small regional theater groups mount productions for the summer. As a life-long-long summer visitor – and new year round resident of Carroll County, NH I am lucky to be close to The Barnstormers in Tamworth, NH. The Barnstormers bill themselves as the “America’s oldest professional summer theater” and I have seen many productions there over the years. The Barnstormers produce eight shows every season over eight weeks – truly amazing – especially considering the high quality of every show. This season I was thrilled to have been able to see five of the eight plays and enjoyed each one – from the season opening “You’re a Good Man Charlie Brown” to William Inge’s “Bus Stop” to the old standby “Gold in the Hills” – each Barnstormers production was well produced with great talent. Tamworth is a small town and maybe the last place you would expect quality theater. However, The Barnstormers pull it off every year and I am lucky to be in the audience. In fact, this season’s production of David Mamet’s “A Life in the Theater” was as well acted as any play I have ever seen in Boston, London, New York or anywhere. Meanwhile, last week while visiting Wellfleet, MA on vacation, I was lucky to partake in one of our great traditions while visiting there – a night of theater at W.H.A.T. 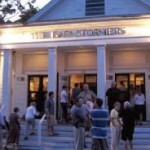 – Wellfleet Harbor Actors’ Theater. 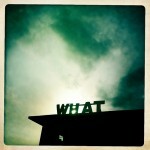 W.H.A.T. is simply great, they are an exciting theater company that pushes the envelope to stage new and edgy works. Every summer on our visit to Wellfleet, my friends and I make sure we take in whatever is being staged at W.H.A.T.’s harbor side theater. We have seen some very interesting plays over the years – from the bizarre to the strange, but always thought-provoking and well produced. We generally go in blindly, getting tickets for whatever they are mounting and it has become a true highlight of our vacations. This year we were treated to the world premiere staging of The Ding Dongs or What is the Penalty in Portugal?. The play was written by – and starring – the incredibly talented Brenda Withers and we enjoyed it immensely. The main point of this post is to express the importance of supporting the small, mostly nonprofit theater and arts groups in your area. Supporting the arts is great way to keep a community vibrant and you never know, you may stumble upon something great. I left for my vacation in Wellflleet, MA with more luggage than one would ever need for a week by the sea. My traveling companion, my life-long friend Lynda, joked that I had more steamer trunks than went down on the Titanic. Part of the bulk were a few books I intended on reading while lounging around on the beach – as well as my fully stocked Kindle. Well, so many good intentions. I never read any of the books – just a few back issues of The New Yorker I had with me and a couple of travel books (for my upcoming trip to Italy). 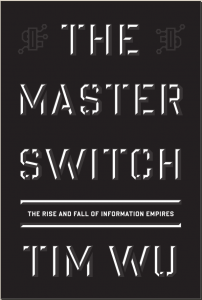 So this week, my first of the regular “Weekly Read” posts, I am featuring a book I read earlier in the summer: The Master Switch: The Rise and Fall of Information Empires by Tim Wu. This book was very interesting to me as an amateur media pundit. Mr. Wu explores the great media empires of the 20th Century, framed as a lesson for the new media (internet, etc.) of which we are arguably only in the first stages. Mr. Wu provides a history radio, telephone, television, and film and compares how these media were started by many entrepreneurs as free and open channels of communication only to end up being closed and controlled by a few large companies. The premise of course is that this is the natural arc and the new media may end up the same way. Mr. Wu makes a great case as he provides many great comparisons of the development of the “old“ media. Although loaded with facts and information, The Master Switch is not a scholarly read. Mr. Wu makes the information accessible and interesting without dumbing it down – and I for one feel much more knowledgeable about our media environment (past and present) than I did before – and I thought I knew much already. The book is peppered with interesting information. For example, I learned for the first time the second thing Alexander Graham Bell said after his famous first line summoning Mr. Watson on his first successful telephone experiment: “God save the Queen!” Which I found funny and of course, understandable as to why that bit has been left out of our history books when discussing the great American inventions. If you are looking for a break from novels and heavier nonfiction books, then I recommend The Master Switch. You will be well informed about the new media mix we are all navigating and sound very smart at your next dinner party discussion. The Master Switch is available from Amazon and other booksellers. Lost Cowboy is powered by	WordPress 5.0.4 and delivered to you in 0.863 seconds using 56 queries.